Last week a friend asked what I thought are the two hardest things to do in sports. Before I could answer he answered, like most people, hitting a baseball followed by hitting a golf ball. But for me the hardest thing in sports is trying to organize drunks at a picnic to play volleyball. It’s like trying to herd goldfish with a stick. Difficulty stems from picnickers viewing the picnic table like its a diving buoy, wanting be within 20 feet of it at all times. And if given the choice between quick access to beer and potato salad or attempting to deny a volleyball its gravitational rights, most will choose picnic table. But on that rare occasion when you do manage to coax enough people to play the game itself, due to varying levels of interest, fails to reward your organizing efforts. Most participants go through the motions, looking for a reason to escape and return to the picnic table. Some actually keep score. And there’s always that one annoying hyper-serious rube – usually the guy wearing blade sunglasses – who plays with such James Bond-like intentsity you half expect that if the ball touches the ground a speeding bus will explode. Consequently, after 65 minutes of organizing the game lasts no longer than 10 minutes. No payoff. No joy. Only frustration. Last week’s game with the Eagles confirmed this ranking. Almost to the extent of knocking organizing drunks at a picnic to play volleyball from the top. The Bills were flagged for 21 penalties. 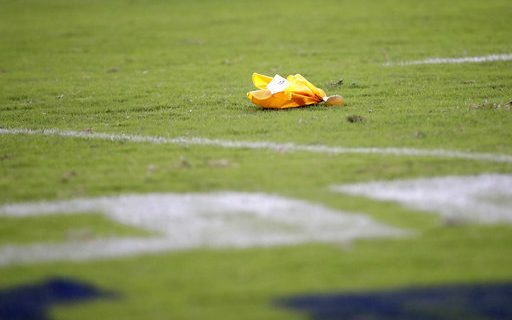 Officials tossed so many flags rumor has it that after the game head official, Ed Hochuli, was so exhausted from turning his wireless microphone on and off that he wept he openly. Regardless of the cause it does not deodorize the stench of the Bills having, after two preseason losses, more penalties (34) than points (26). The NFL record for most penalties in a season is 158 held by Kansas City. At this rate – averaging 17 penalties per game – the Bills, in a 16 game schedule, would shatter the mark with 272. Yes, it’s only preseason. And yes during the team’s four-year Super Bowl run it never sported a winning preseason record, even going winless in 1990. But attempting to remain optimistic after these first two games burdens the mind. A strong showing in this week’s game against Baltimore would, perhaps, make it easier to feel encouraged about the approaching season. And maybe, if so, maintaining Bills optimism would drop to third on my Hardest Thing to do in Sports list behind feigning wide-eyed interest at my nephew’s middle school soccer games.